At The Thistle & The Rose we are always honoured when asked to provide funeral flowers. At this difficult time, a flower arrangement can be the single, most effective way to express your love and feelings when saying a final farewell or to comfort the bereaved. We have a range of funeral tributes available in our online shop and you may like to order in this way, simply select the product you wish to send and follow the simple ordering process. 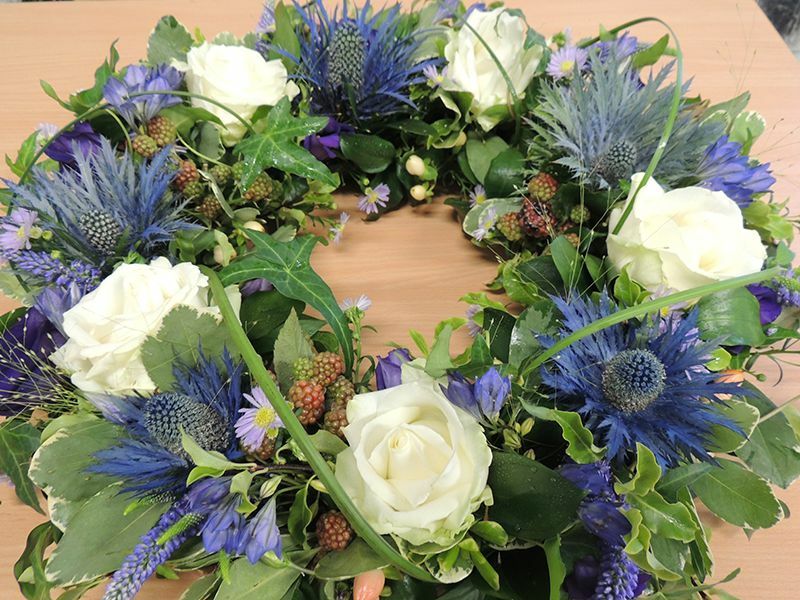 If you need some advice regarding funeral flowers, The Thistle & The Rose will of course assist and support you in choosing an appropriate tribute. Please don't hesitate to call or we can offer a local home visit if this would be a more convenient option for you. When you have chosen your tribute, we will then liaise with the funeral director so you have one less thing to worry about. When ordering funeral flowers, it would be much appreciated if you could please give at least 48 hours notice. It can be difficult to compose a message at such a sad time. Even just a few words of heartfelt sentiments will be appreciated. We have the following suggestions which may be of help. Coffin Tops or Casket Sprays are usually selected by immediate family members. 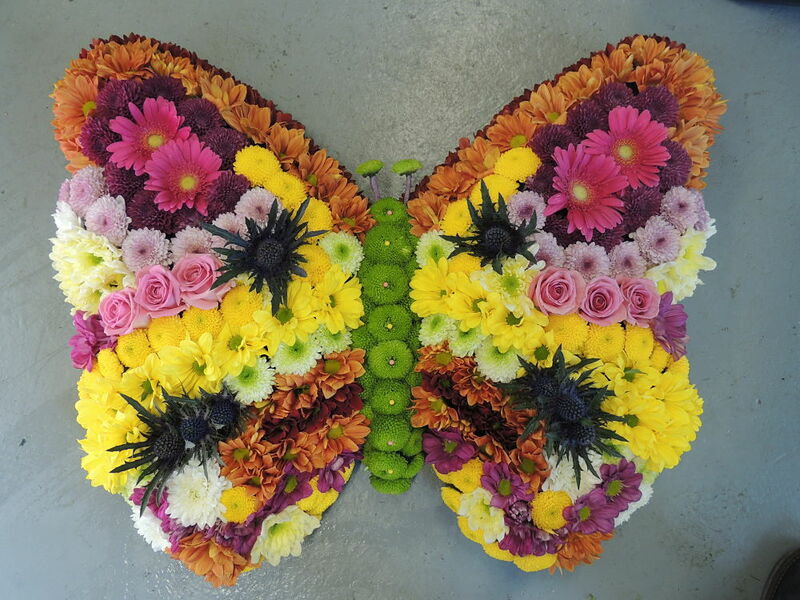 This arrangement can be made in various lengths up to full coffin size. Tribute sprays can be single ended to give a tear drop shape or a double ended spray gives a more symmetrical almost diamond shape. 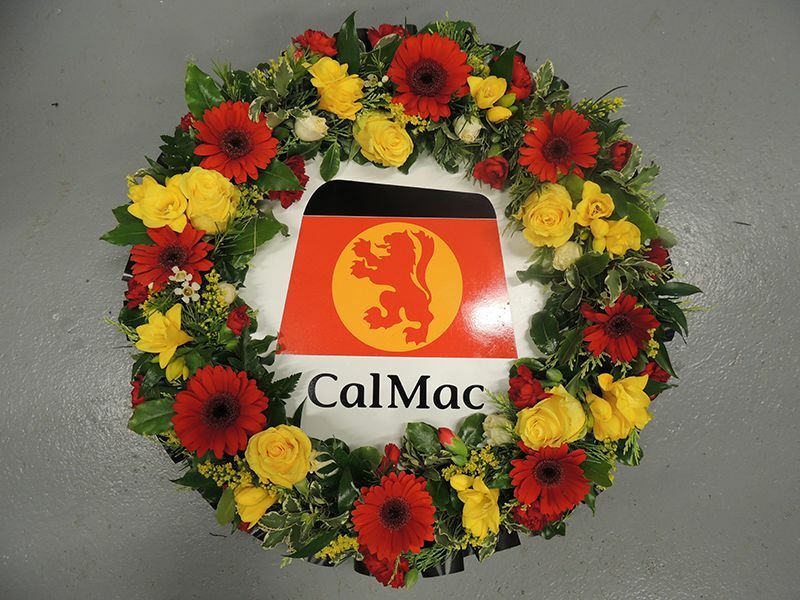 Wreaths are a circular shape that symbolises eternal life. Wreath styles can be either traditional or contemporary and are available in various sizes and styles. Posies are round in shape and slightly domed so that the flowers and foliage are seen to their best advantage. Posies are available in various sizes. Sheafs offer a more informal tribute to consider, simply finished perhaps with raffia or ribbon for a more natural look. Hearts are often chosen to symbolise the love felt by immediate family or the closely bereaved. Baskets are another less formal floral tribute you may wish to consider. A cottage garden style arrangement is a beautiful way to say goodbye. Letter/name tributes are often chosen as a centrepiece by close family members. Cushions and Pillows are symbolic of comfort in the last resting place and can be made in a variety of styles and shapes.